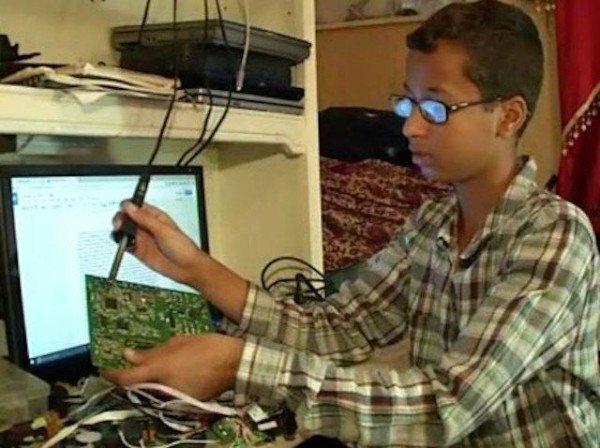 Texas student Ahmed Mohamed, who was arrested in Irving after his teacher mistook his homemade clock for a bomb, will move to Qatar with his family. The 14-year-old Muslim boy has accepted a scholarship from the Qatar Foundation for Education, Science and Community Development, where he will study. Ahmed Mohamed met President Barack Obama at the White House on October 19. After being detained over the clock, Ahmed Mohamed’s case went viral on social media. Some alleged the boy was unfairly treated because of his name and religious background. Officials in Irving Texas defended their decision, saying they were only concerned with the safety of students. The Qatar Foundation is providing a full scholarship for his secondary and undergraduate education, according to a news release. “Our family has been overwhelmed by the many offers of support we have received since the unfortunate incident of Ahmed’s arrest,” the Mohamed family said in the release. According to his family, Ahmed Mohamed will be enrolled in the Qatar Foundation’s “Young Innovators” program and his whole family will relocate with him to Qatar. “Qatar was a cool place to visit. I loved the city of Doha because it’s so modern. I saw so many amazing schools there, many of them campuses of famous American universities,” said Ahmed Mohamed in the news release. Ahmed Mohamed withdrew from his Texas school shortly after the clock incident. The boy was arrested after his teacher mistook his clock for a bomb, sparking outrage and the trending hashtag #StandWithAhmed. In addition to being invited to the White House, Ahmed Mohamed received an outpouring of support from scientists, politicians and celebrities.